"Installation view from the exhibition Norden in Kunsthalle Wien"
From left to right: work by Öyvind Fahlström, Esko Männikö, Jan Svenungsson, Joakim Koester. The exhibition curators were Sabine Folie and Brigitte Kölle. JS's installation was a 8 x 8 m wall installation of various real and unreal chimney-projects, including the images and a Technical Plan for the Vienna Chimney. 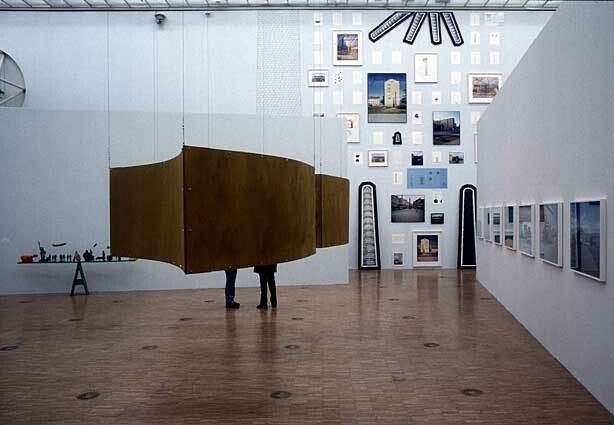 Exhibition Norden, Kunsthalle Wien, until September 17, 2000.